"The [NLRB regional director] failed to consider or disregarded community of interest factors long recognized by Board rules, policies, and precedent," PPRM lawyers said in a filing. "The principles of freedom of choice, collective expression, and efficient and stable collective bargaining … will be best served by the employer-wide or overall unit sought by PPRM." The board sided with Planned Parenthood in a 2-1 decision. Trump appointees Marvin Kaplan and William Emanuel said the unit should be reevaluated. In December, the board reversed an Obama-era decision that allowed unions to organize segments of a company, rather than hold elections across the entire workplace, overturning long-standing precedent against micro-units. Planned Parenthood argued that the SEIU's attempt to organize nurses in a specific territory ran afoul of the Trump board's decision. A spokesman for PPRM declined comment, saying the organization does not discuss ongoing legal matters. SEIU Local 105 did not respond to requests for comment. The dispute represents a rift between two of the key players in the Democratic Party. The two groups have been allies in the past. SEIU has given Planned Parenthood $190,000 since 2007 in payments classified as political activities or "contributions, gifts, and grants," according to federal labor filings. Planned Parenthood's political arm, meanwhile, sent more than $290,000 to SEIU councils in Missouri and Washington State during that time. SEIU president Mary Kay Henry defended Planned Parenthood after undercover videos showed clinic workers candidly discussing the sale of baby body parts. "We stand united with our allies at Planned Parenthood, champions of quality health care and a cornerstone of vital services to millions of Americans for decades," she said in a release. 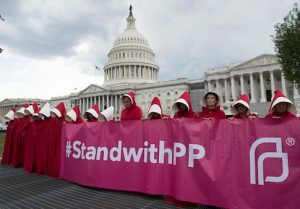 "It's time for the leadership of both political parties in Congress to stand with women and against these vicious attacks on Planned Parenthood." The ties between Planned Parenthood and SEIU run deeper than money. Former PP honcho Cecile Richards is married to Kirk Adams, the longtime head of SEIU's health care branch. In 2014, Planned Parenthood hired SEIU executive Ellen Golombek to lead an initiative to align the abortionist with other leading liberal groups. Planned Parenthood is not alone in its opposition to unionization despite its liberal identity. Media Matters for America opposed SEIU's attempt to unionize its workforce and pushed for a secret ballot election despite publishing articles condemning such elections as oppressive to workers. Peter List, a former union official turned labor watchdog, said liberal groups are guilty of hypocrisy when they ally with unions publicly, but oppose organized labor in their own workforce. "It's ironic, insofar as Planned Parenthood relies heavily on the SEIU to provide the abortion provider with financial and public support, that the relationship is not reciprocal," he said. "However, like the SEIU's management itself being somewhat hostile towards its own staff being unionized, it is not uncommon for progressive organizations like Planned Parenthood to claim progressive values on the one hand, while acting like 19th-Century bosses when their staffs want to unionize on the other hand." The union argued that the clinics do not share management and operate largely independent of one another across state lines. Workers in the 14 Colorado clinics are subject to similar management and share a "community of interests" because of their interactions. SEIU said these interactions rarely cross into Nevada and New Mexico. "The absence of any interchange of employees, lack of geographic proximity, lack of any functional integration of operations and separate first and second level supervisors between the non-contiguous states of Nevada and Colorado where the appropriate unit exists is reason enough to reject the Employer's request," the union argued in an NLRB filing. "While the employees in the employer-wide unit also share common skills, duties and terms of employment, the indisputable evidence shows no employee interchange between the appropriate unit and Nevada and almost no interchange with New Mexico." Planned Parenthood relied on the support of the Republican majority to contest SEIU's organization bid. NLRB Democrat board member Lauren McFerran rejected the abortion provider's argument. She said the Colorado-specific vote was "reasonably" determined and that PPRM's request to include clinic workers in Nevada "could be prohibitive" given the distance between the clinics. "In many, if not most, instances, such daunting geographic barriers could be prohibitive to employees’ right to choose and engage in collective bargaining," she said. "Despite the Employer’s failure to posit other alternatives, the [NLRB] Regional Director made an independent unit determination that gave geographic proximity the weight it deserved alongside the other relevant factors for multi-facility unit determinations." The matter will now go before the agency's full five-member board, which Republicans control 3-2.